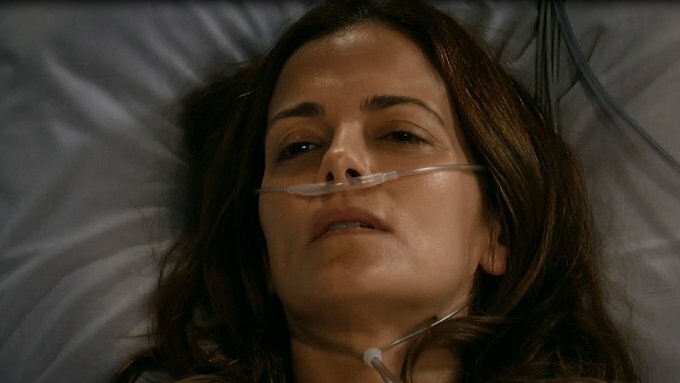 Rebecca Budig is not only back at General Hospital as Hayden Barnes, she's on contract! The character will emerge from the coma she's been languishing in since May, when she was shot in the head on orders from Nikolas. When executive producer Frank Valentini called to invite her back, "I was surprised!" she tells Soap Opera Digest. "I thought I came in and I did my job, and that was all that I was meant to do — come in, cause some trouble and leave." She's thrilled to have been wrong, saying, "I love being there and I am working with a great bunch of people." Hayden was about to tell Jake that he was really Jason when she was shot. But what will she remember now? On Friday's episode of GH, Patrick (Jason Thompson) told Jake (Billy Miller) and Sam (Kelly Monaco) that Hayden was waking up. Watch a sneak peek scene below from Monday's episode featuring the now awake Hayden. I wish soap executives would keep a secret a secret. Takes the anticipation out of "Will Hayden wake up" if you announce that she's back on contract before the episode even airs! Compare this to the end of the episode where we saw Michelle Stafford open her eyes and says "Silas!" before anyone even knew she was on the show-- a great surprise.